Q: Shalom Kevin. I have been raised as a Gentile Christian my whole life, but within the last year or so, I have been experiencing an ever-increasing draw towards the Messianic Jewish community. The Gentile Churches make me want to vomit and mourn; as they are straying farther and farther from Yeshua. My whole family is beginning to look at me strangely as my heart wants to forsake this thing called “Christianity,” and I long to embrace and understand the culture and ways of God from the Hebrew- and Jewish-Roots. I am very attracted to the Messianic Community, though I have not yet visited a congregation. I am a Christian who is crying out for help, and I want to disconnect from my paganistic Christian upbringing and come until full maturity in Moshiac by embracing our Jewish roots. Any guidance, info, or words of wisdom would be appreciated. A: Thank you for your heart-felt letter. This is a huge question, and you are not alone in asking it. The one thing I feel compelled to urge you is to not hope to find closeness to Yeshua simply by virtue of attending a Messianic congregation—do not be enticed by Jewish things (or allegedly Hebraic thinking) believing that simply because they appear Jewish they are therefore a reflection of authentic, Scriptural Yeshua-faith. Unfortunately, Messianic congregations have the potential to be just as steeped in religiosity as the Christian church. So, if you look to Messianic congregations intent on finding that elusive “true faith,” you may attend services for a while and become enraptured by the novelty of expression, but if you don’t eventually find yourself “wanting to vomit and mourn,” you may simply be taking on one form of religion in place of another. My caution is that you do not start down the path of so many who have reviled the pagan roots of Christianity, and (as a reaction) sought out Christianity’s “Jewish roots,” only to end up creating a new religion of their own. It sounds to me like you want Messiah more than you want religion… so don’t go the way of the “religion-swap” in pursuit of your destiny with Yeshua! What do you think? Weigh in with your comments below. Excellent point, Kevin. This writer seems to be experiencing the same thing I went through beginning in about 2000, and what a large and growing number of other people have also been experiencing during recent years. Once the scales start to fall off the eyes about the origins of much of what goes on in Christianity, a normal tendency for those believers has been to start trying to adopt a Rabbinic lifestyle. 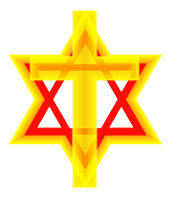 In fact, there are some former Christians who have gone so far as to fully embrace Judaism and deny Yeshua. There is a ditch on both sides of the road, and a number of the practices of Judaism are as far from truth as the Christian traditions. The L-rd is awakening many believers these days, but He does not want us to trade in one set of manmade traditions for another; I believe He wants us to pursue truth with a passion. I agree to your opinion about ” religion swap ” issue. I, myself was once a christian gentile for a while, until when yeshua has found me, and guide me to follow him in truth. being a messianic believer for so many years, has led my heart more close to Yeshua, not because ,I am a messianic. I prayed so hard that one day in my life, I would be as close to Yeshua in His truth, following His teaching in a more truthful way. Now that He’s in my heart as close as ever, I shared this to others ,too. Praise Him, Hashem Adonai ! Kevin. You have given excellent counsel! I share the swapping-of-one-for-another error that some make. I do feel, however, that there is a G-d instilled void in many lives that cause people to desire a more Jewish understanding of G-d’s revelation to man. In many churches, a new birth experience isn’t really taught. Accordingly, I encourage people to attend a Messianic congregation in the hope that , there, they will have a personal salvation experience. Further, many churchmen need to chuck some beliefs that simply innoculate the believer against a deeper relationship with G-d.
Keep up the good work! Excellent!!! I am a gentile Christian aswell, however I would say to the brother that my seeking that found Messianic Jewish brothers was a seeking of as much informaiton as I could about Jesus. I would suggest that I have learned more about Yeshua our Messiah from Kevins devotional books. Remember it is a relationship not a religion. My wife and I just returned from Israel and my intimate relationship with our Lord has grown . Pray for our Palistian Christian Brothers as well. Shalom Bride of Christ. I was very interested to read the comment and reply on the article “religious swap”. I too had a great desire to search out my Jewish roots b/c I thought the Jewish people had a corner on God. I’m Gentile and have since learned so much. Your reader has been taught probably the same way that I was taught that everything in the Bible, Old and New Testament is for the Gentile believer. That is where we start to go wrong. It would take me eons to explain what I have learned in the past year concerning the Jewish culture, their promised Kingdom, and the age of grace. I trust the writer will continue to search, and pray for guidance. Thank you for not being harsh, or condesending. Good advice from you to the writer. Thanks for your articles. They are so helpful. I too agree and support Kevin’s counsel. Through circumstances which left me broken, at the age of 50 I came to a rebirth and realized that I did not truly know the Lord. Oh, I had been a “Christian” for those 50 years, but did not have a relationship with Him, especially the Holy Spirit. In crying out to God for Him to show me Himself and all His ways, He lead me to a Messianic fellowship. It was through spending much time in His Word and observing, listening, questioning, and PRAYING! that He has shown His faithfulness to draw nearer to me and reveal His many characteristics, especially through the historical love story with His Chosen People. God’s eternal purpose included bringing in all His creation, (Gentiles, nations, whatever you want to term it) and I thank Him everyday for the obedient Son, Yeshua, and the shed blood of atonement that brought me into the Kingdom. We (those of us that are maturing in a Messianic understanding) may be blessed with an open heart and mind to learning and growing along side of our Messianic Jewish brothers and sisters (with Kevin’s caution noted discernment), but then I believe that we have a righteous responsibility to then share not only to the Jew first, but also to gently and lovingly share the new facets of The Diamond with our Church brothers and sisters. Excellent, short and to the point, Kevin! Bless you! This was/is a struggle for me as well. While ‘feeling’ and embracing a more Hebrew approach to my relationship with Yeshua, I took on the trappings and ‘fence-laws’ that He spoke against as if they were ‘required’. I shoved it down the throats of all who were within earshot…to the point of blocking many family members from seeing. Now forgiven of doing so, I see the relationship as a Gentile believer much more clearly. Thank you for this – to both the inquirer and to Kevin! Wow! Brother Kevin you always seem to address the issues that are closest to my heart. I too have experienced this. Went from the church right into another religion – called Messianic, but was really a version mixed with rabbinism. I didn’t know it until the “leader” said it was his congregation. That shocked us!!! We thought we were just a bunch of believers coming together to have fellowship. We didn’t agree with how they did everything, but we compromised for the sake of fellowship. We were very dedicated. However, now we are back in the desert. I just learned that the congregation mentality is not the same as a community mentality. A community is concerned with l’dor v’ dor – passing the unadulterated Torah onto the next generation. The present and the future is their focus. A congregation is present focused to keep numbers and finances up by creating new programs. My heart is always thinking about the next generation, as we have children we are raising up and teaching in the way they should go. If the Torah is not passed onto them, where are we? Our children are our future. I just learned that the Mishna was created to interpret the Torah; the Gemara was created to interpret the Mishna; and the Talmud was created to interpret all of them. The Torah can stand on its own! Religion is not the answer. Relationship with the One True Elohim is! We realize that the reason we were taken into the wilderness again is because we had begun to trust in man. Yet the Scriptures tell us to put our trust in the Almighty – Ps. 40:4; 118:8; Jer. 17:7 and not in man – Jer. 17:5; Hos. 10:13. Yet, we stumble and fall because we want to be the Body, the ekklesia of Yeshua soooo badly. We want community. I am in the same spot that the person was who is in this article. the Holy Spirit has not released me from my Christian church yet. I am seeking G-d what to do. Thak-you, Kevin for your web-site. Love the Jewish people and Israel! i too have found myself, a gentile Christian, feeling drawn to messianic jewish learnings for a few years now. Once Yeshua opened my eyes to scriptural truths, some “church” doctrine foundations crumbled. I am thankful to know there are others, like myself. My family and co-workers are not accepting of the thoughts of my desire to draw closer with the inclusion of messianic jewish teachings. Thank you for addressing this issue. i’m tired of playing church and am searching for what i believe is the rest of the story in Messianic Judaism. i don’t do religion, but relationship with our Messiah. there aren’t any congregations in my town, so i’m seeking information online. i’ve come too far and i know too much to go back. Someone posted this on facebook & I’d like to also respond. Obviously the response was good, but let us encourage our newly awakened brother to visit messianic congregations without all this fear. 1 Cor 1:10 I appeal to you, brothers, by the name of our Lord Messiah Yeshua, that all of you agree, and that there be no divisions among you, but that you be united in the same mind and the same judgment. 11For it has been reported to me by Chloe’s people that there is quarreling among you, my brothers. 12What I mean is that each one of you says, “I follow Paul,” or “I follow Apollos,” or “I follow Cephas,” or “I follow Messiah.” 13Is Messiah divided? 2 Cor. 11 2For I feel a divine jealousy for you, since I betrothed you to one husband, to present you as a pure virgin to Messiah. 3But I am afraid that as the serpent deceived Eve by his cunning, your thoughts will be led astray from a sincere and pure devotion to Messiah. Just some scriptural reminders no matter where the Lord leads you and in what type of congregation He plants you. Wow, thanks Kevin! I thought I was wrong for thinking the same thing. I kinda got drawn away a little by that very exchange and I didnt want to vomit but it did feel very empty and seemed more like an ‘us against them’ club. Not cool. There are none that are perfect, no not one, …. none of the “churches” have it exactly right. There are none of the Messianinc synagogues that have it exactly right. We must firstly seek God and His ways, keeping our eyes on Him and not “man”, trusting ONLY God and not “man”. We are commanded to love “man”, not trust him. “Man” will ALWAYS let us down, God will ALWAYS do His level best to protect us from harm/false teachings. We must pray without ceasing for the filling of the Ruach/Holy Spirit to give us discernment, and be loyal to God and Him alone. I am a gentile Believer. My prayers for years have been asking God to make my walk with Him real and natural, as an involuntary movement, like breathing may it be something that I just “DO” and may it be life sustaining to me. I am tired of playing “church” with the christians who pick and chose scriptures from the Word to live by and reject the rest. I want to be as the first believers were in Acts. I pray that everyone who is truly seeking Him with their whole being, willing to go anywhere, and change anything in their lives as long as He is there, I pray we find His truth and live by it completely and to the death. FIll us with Yourself Lord, show us Your mysteries, the mysteries of You. Kathy Wilson has a song that says” I’m willing to leave the familiar, I ‘m willing to leave what I know, if You’ll go with me. I’ m willing to go where You lead me, I’m willing to do what You say, if You will stay with me. Crossing over, crossing over leaving all I know behind , crossing overand not knowing what I’ll find. Crossing over crossing over, leaving all I know behind, crossing over knowing that it’s You I’ll find.” May we step out and away from false teachings praying in purity for His truth and obedience in living the way that pleases Him. SO be bold my brothers and sisters, bold enough to hear His calling and purely follow where He leads in spirit and in truth. Baruch HaShem! Blessed is He! I just am overwhelmed with feelings of gratitude for my Father leading me to this site! Every question, every concern, and every comment could be my own! My journey is at its beginning out of the fog of the christian church of false and pagan doctrines. I long for fellowship and community yet my heart and spirit will not allow me back to church. Where man leads it will become corrupt I believe. Shepherds were just that, shepherds without personal financial gain to be concerned with. How grateful I am that Yeshua has opened my eyes, given me site when I was blind my whole life, and I can rest knowing He will continue to guide me as I have no ability to claim anything of this new knowledge and site as my own doing….it is all Him. He is my true Guide and Redeemer, my counselor and my protector from all unrighteousness. Clean my heart my Father that I may be a vessel of your love. Good word brother! May our Father continue to bless you with wisdom and shalom!